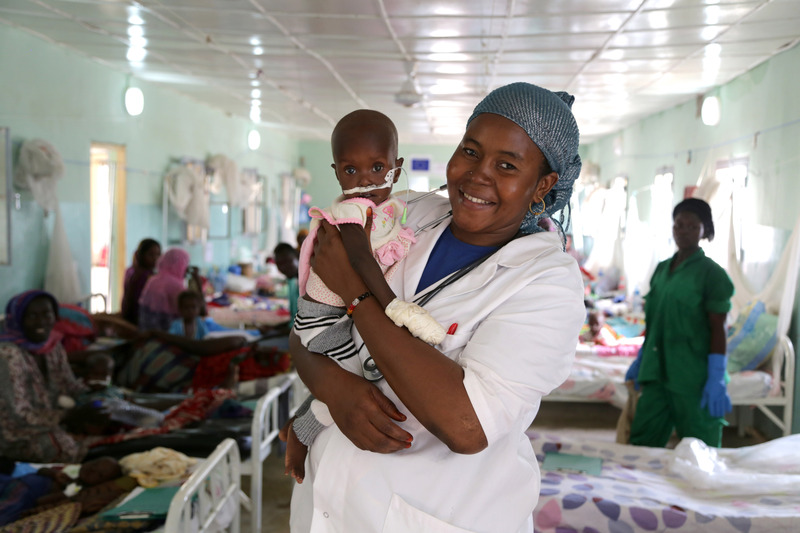 Superwoman Darasalam at the heart of fighting malnutrition in Chad | YALNA, "Nos enfants"
The sharp shriek of a rooster at the break of dawn is the abrupt alarm clock that starts what is a very busy day for supermom, 28-year-old Darasalam. She gently wakes up her six daughters, quickly prepares breakfast, gets the children ready for school and herself ready for work – all before 7am. As she inserts the key into the ignition of her scooter, her already packed morning shifts the day into another gear as she sets off to the Therapeutic Feeding Centre at the Liberté hospital where she works as a Nutrition Counselor. The UNICEF-supported center is run by the NGO Alima with financial support from the ECHO, the European Commission’s Humanitarian Aid and Civil Protection Department. Like many young girls in Chad, Darasalam was married very early – before she was 18 years old. But that didn’t keep her from pursuing her dream of a career in the medical field. « At first, my husband did not want me to study. But with time he saw how sick I was getting just by being at home and eventually, he was convinced and I studied to become a Medical Assistant.” Balancing a career and a family is not easy though and she admits that she has little free time with her children but she says, “ They understand that I love what I do ». The passion for her work and love for children is what motivates her each day in what is a demanding job at the Feeding Centre that treats some 300 children with severe acute malnutrition each month. Chad has the third highest child mortality rate in the world, with one out of every six children dying before their fifth birthday. Malnutrition is among the leading causes of child mortality in Chad. In late December 2011, the Government of Chad officially declared a nutrition crisis in the Sahel belt and appealed to the international humanitarian community for support to avert a famine. In response, UNICEF together with the government of Chad and with the financial backing of the European Commission’s Humanitarian Aid and Civil Protection department (ECHO), rolled out a rapid expansion of therapeutic feeding centres as well as other community led interventions to target malnutrition. In just four years, the number of feeding centres doubled to the current 500 centres now in operation across the country treating close to 150 000 children every year since. Nutrition counselors such as Darasalam are critical to tackling malnutrition. Each day, she swiftly moves among the rows of young patients making sure the children are eating correctly and advising the mothers on how to prevent malnutrition by preparing nutritious food at home and knowing what action to take if the situation worsens. Changing mindsets among mothers about how to treat malnutrition is one of the biggest challenges she faces. « The problem is that too many children arrive here after being treated by quacks and marabouts (religious practitioners). Some women even come to the health center with weird mixtures those people gave them. Some children arrive between life and death. I ask mothers to leave these things and let us work if they do not want to lose their child, » she explains. A permanent smile and a deep devotion to children: this is Darasalam’s simple recipe to warm the hearts of worried mothers and sick children. Through collective counseling she sets the mothers minds at ease and follows through with each child during their stay in the centre, which is usually a couple of days. Often this means she has to harness her skills as an actress in addition to her technical skills as a counselor. « I try to make them laugh, make them react. To do my job, you need to have a fighting spirit and the talent of an actress » she says, laughing.